Erbil, Kurdistan Region, Iraq (cabinet.gov.krd). 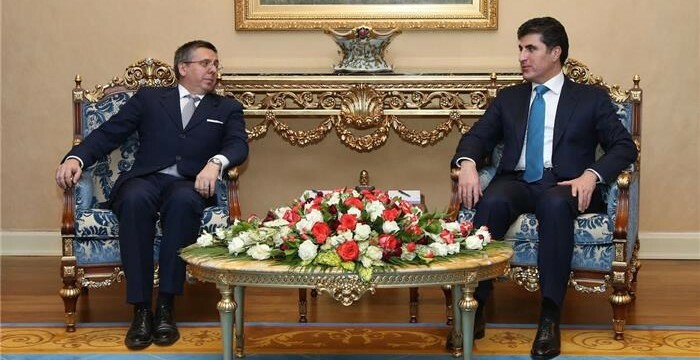 The current financial crisis was discussed at a meeting of the Kurdistan Region Council of Ministers yesterday, chaired by Prime Minister Nechirvan Barzani, with Deputy Prime Minister Qubad Talabani. Prime Minister Barzani said that meeting extraordinary expenses, caused by the war against the Islamic State terrorist organization, that the Kurdistan Region fights also on behalf of the world, and accommodating close to two million refugees and displaced persons, has been greatly worsened by the dramatic decrease in the price of oil that is the primary source of public revenue. He remarked that since February 2014 the Federal Government of Iraq has failed to provide, as agreed, the Region’s full share of national revenue, a move which marked the beginning of a serious financial crisis, culminated in the recent sharp fall in the oil price, which adversely affects many oil producing countries. As the Kurdistan Region is not a sovereign entity, Prime Minister Barzani explained that the KRG is not in a position to print currency nor establish credit in the international financial market. Deputy Prime Minister Talabani briefed the Council about the steps already taken and needed yet to be taken by the KRG to effectively manage the crisis. He remarked that the Presidency of the Council of Ministers and relevant authorities frequently meet to monitor the situation, follow up on measures being taken, and discuss additional measures. He reiterated the Kurdistan Region is alone in this financial crisis and emphasized that along with austerity measures a series of reforms needs to be effectively implemented. He stated that in the interest of transparency the KRG will publish relevant data and information about its financial obligations and resources available and needed to meet them. The Governors of Erbil, Duhok, and Halabja also attended the meeting. The Governor of Slemani was unable to attend. Erbil, Kurdistan Region, Iraq (cabinet.gov.krd) – Prime Minister Nechirvan Barzani yesterday received Mr. Marco Carnelos, Italy’s ambassador to Iraq, accompanied by a diplomatic and military delegation. Mr. Marco Carnelos reiterated his country’s commitment to continue providing military and humanitarian aid to the Kurdistan Region. He commended the Peshmerga forces of the Kurdistan Region for their role in defending all the citizens against the Islamic State terrorist organization, ISIS. He noted that his country has decided to send another specialized team to train the Peshmerga, police and Zerevani forces. Prime Minister Barzani expressed his gratitude for Italy’s military and humanitarian aid and welcomed its decision to send a special team to train Kurdistan Region forces. Regarding the large number of displaced people who have fled terrorist threats and took refuge in Kurdistan, Prime Minister Barzani hoped that the international community will raise the level of its assistance to this vulnerable population. Bilateral relations and Kurdistan Region’s relations with Baghdad and neighboring countries were also discussed in the meeting. Erbil, Kurdistan Region, Iraq (cabinet.gov.krd) – Prime Minister Nechirvan Barzani yesterday received Mr. Lodewijk Asscher, Deputy Prime Minister of the Netherlands and his accompanying delegation, which included the Dutch Minister of Defense, Ms. Jeanine Hennis-Plasschaert, the Dutch ambassador to Iraq and a number of military and diplomatic advisers. In the meeting, which was also attended by Kurdistan Regional Government Deputy Prime Minister, Qubad Talabani, and a number of KRG ministers, Netherlands Deputy Prime Minister commended the people, government and Peshmerga forces of the Kurdistan Region for their role in protecting all the citizens, from various ethnic and religious background, against terrorism. He also praised the Kurdistan Region for having accommodated, despite the hard financial and economic crisis which it faces, a large number of displaced people who have fled from the grip of terrorism. He expressed his country’s readiness to continue to provide military and humanitarian aid to the Region. Mr. Lodewijk Asscher also welcomed the financial reform measures, recently taken by the KRG and expressed his country’s readiness for any cooperation in this regard. Prime Minister Barzani expressed his gratitude to Netherlands for its military and humanitarian aid. He highlighted the economic crisis in the Kurdistan Region, stating that in order to address the situation the government has taken a number of necessary measures, and expressed his hope for the cooperation of friendly countries in this regard. While expressing his gratitude to the Netherlands and the international community for providing humanitarian assistance, Prime Minister Barzani hoped that the international community will offer further aid to the refugees and displaced persons. Regarding the Region’s relations with Baghdad, Prime Minister Barzani stressed that the KRG wants to settle all the problems with Baghdad through dialogue and mutual understanding. Pirmam, Kurdistan Region (dfr.gov.krd) – President of Kurdistan Region, Masoud Barzani, yesterday hosted foreign diplomats and representatives of international organizations based in Erbil to discuss the developments in Kurdistan and the wider region and to reflect on 2015. At the outset of the meeting, the Head of the KRG Department of Foreign Relations, Minister Falah Mustafa gave an overview of the activities of the Department of Foreign Relations and stressed that despite the challenges facing the region the KRG continues its efforts to expand ties with the international community. In his remarks to this annual gathering, President Barzani wished the members of the diplomatic corps a Happy New Year and then shed light on a number of key issues facing the Kurdistan Region, in particular the military, humanitarian and financial challenges and ties between Erbil and Baghdad. Highlighting the sacrifices of the Peshmerga forces President Barzani Said, “Our brave Peshmerga forces have destroyed the myth of ISIS. With limited resources, Peshmergas have been able to inflict heavy damage on ISIS terrorists and regain control of 27,000 square kilometers that was lost to ISIS in the summer of 2014.” Referring to the fate of areas that fall under article 140, the President emphasized that the Kurdistan Region will not impose its will and that the people living in those areas will have the right to decide their fate through referendum. The President thanked the members of the counter ISIS coalition for their military support to the Peshmerga forces but stressed that continued support is needed, as ISIS remains a threat to regional and international peace and security. He encouraged all regional powers to unite forces against ISIS and stated that the Kurdistan Region will not be part of the ongoing sectarian rivalry across the Middle East. President Barzani reiterated the commitment of the Kurdistan Region to solve its outstanding issues with Baghdad through dialogue and peaceful means. Commenting on the internal political developments, the President said that he would meet all political parties in the Kurdistan Region to reach a consensus on the outstanding political issues. On behalf of the diplomatic corps, the Consul General of Palestine, Nazmi Hazouri, who serves as the dean of the diplomats, thanked President Barzani and DFR for the opportunity and valued KRG’s humanitarian and military role in the face of regional crisis. At the end of the meeting, several diplomats and representatives exchanged thoughts on developments in Kurdistan and the wider region with President Barzani. On the occasion of the New Year, we present you our warmest wishes, hoping that it will mark the beginning of a year of happiness and further stability for our homeland. We present our greetings to the Peshmerga forces in the trenches of honour and the families of the martyrs of the Kurdish cause. We reaffirm that they will remain the symbol of freedom and stability of Kurdistan. The year 2015 witnessed a series of hardships for the people of Kurdistan: continual attacks by the Islamic State terrorist organisation, ISIS, against Kurdistan Region, the martyrdom of many of our brave Peshmergas, sever economic crisis, imposed on the Region by Baghdad government, in addition to internal political disagreements, which further complicated the situation. Meantime, however, 2015 marked major victories on the battlefield and liberation of vast territories of Kurdistan, which were occupied by ISIS terrorists, thanks to the sacrifices of Kurdistan Peshmerga forces. We hope that in 2016, we will overcome all the obstacles and crises, and that this new year will be the year of final victory against terrorism. The Kurdistan Regional Government reaffirms that it will continue to exert all its efforts to address all the problems, and reassure you that all the rights of Kurdistan Region citizens will be preserved. We extend our thanks, appreciation and gratitude to friendly countries and the international coalition in supporting the Peshmerga forces and the people of Kurdistan in the war against ISIS, to achieve victories and liberate large territories, which were under ISIS control, and thus helping to maintain Kurdistan Region’s stability. We extend our appreciation and respect to the people of Kurdistan for their resilience in these difficult circumstances. We are confident that our people, who have overcome more difficult situations, will, undoubtedly, be able to overcome the current crisis as well.